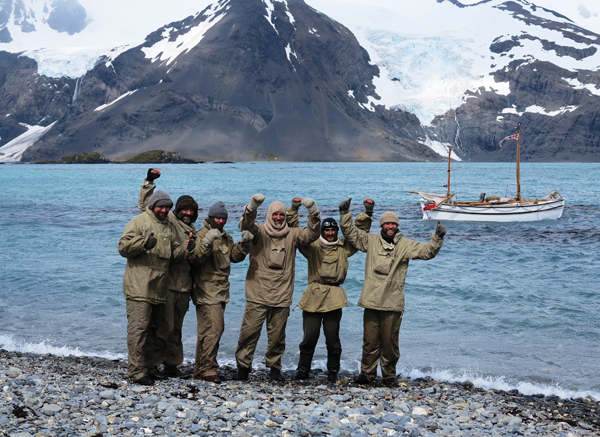 Nearly a century after Shackleton’s famous escape from the ice, six men spent 12 days in a living hell to recreate “the greatest small-boat voyage of all time”. The 800-mile voyage across the Southern Ocean that Shackleton and five of his men made in 1916, to fetch help for the rest of his party stranded on Elephant Island after the sinking of their ship Endurance, has been frequently referred to as the greatest small-boat voyage ever made. Sir Ernest Shackleton himself, traditionally number two to Scott in the canon of British Polar explorers, has become a rare winner in the post-empire trend of historical reinterpretation, a viewpoint often inflected with an undeclared vein of inverse snobbery. No doubt some of the men left stranded in 1916 did pray that Shackleton and his five men would reach salvation – the whaling station at Stromness on the north shore of South Georgia – which of course, they did. This was a time decades before the first OSTAR (1960) and the first Fastnet (1925), never mind today’s global daredevil spectaculars like the Velux and Vendée races. In 1916, the Great War waged and, out of radio range, not a soul on earth knew of Shackleton’s plight. The idea of sailing a 23ft 1in (7m) ship’s lifeboat with a makeshift deck of canvas, 800 miles across the Southern Ocean in winter, must have seemed daunting and surreal. 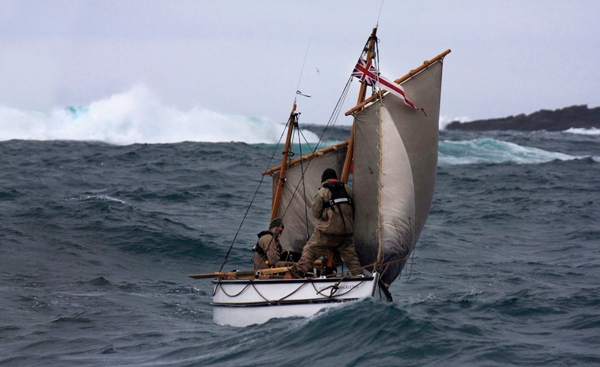 In 2009, Ernest’s granddaughter Alexandra Shackleton approached environmental scientist Tim Jarvis to lead a re-enactment of what has become known as the ‘Shackleton Double’ – the treacherous sea voyage followed by a land crossing from the south of the island of South Georgia to Stromness – in vintage kit. Tim’s measured manner and soft Australian accent inspire confidence nearly as much as his past polar expeditions, which include a historically authentic 2007 march across Antarctica in the footsteps of Douglas Mawson’s 1912 expedition, to see if Mawson could have survived without eating his companions. Luckily for Jarvis’s film crew, he succeeded. “We live in an age where convenience has become the most desirable quality. I don’t think everything should be easy,” he told CB at the project’s launch at London’s In & Out club in September 2012. A long trestle table was laden with coils of natural rope, old packing cases, antique chronometers and cotton haversacks. This lovely stage set was, in fact, the actual equipment for the voyage. The build of the new James Caird, named Alexandra Shackleton after the voyage’s patron, was just as authentic. She was built at the International Boatbuilding Training College normally, as a double-ended whaler in larch on oak, then given three extra planks for topsides, originally an in-situ retrofit by Shackleton’s carpenter (and mutineer at one point in the expedition) Harry McNish. The original deck, canvas over a lattice-work of packing case wood and sledge runner, that bore a “strong likeness to stage scenery” (Shackleton), was replaced with a real tongue-and-groove wooden deck covered in canvas. A mast was bolted to the keelson as a hog strengthener, in replication of another of McNish’s retrofits in 1916. Anyone who has read Shackleton’s book South, or just contemplated sharing a space the size of a small double bed with three other fully clothed, soaking wet men in sub-zero conditions on the Southern Ocean for two gruelling weeks, can imagine that the trip would not be easy. Quite how hard it might be would be impossible to realise, without actually going out there and trying. Early sea trials were not confidence-inspiring; Tim Jarvis reported appallingly claustrophobic conditions, with each man below decks needing to be choreographed limb by limb from the cockpit so they could all lie down at the same time. He reported seasickness from the boat’s awful motion and noted how hard it was to navigate or cook. And this was in the Solent. Nevertheless, on 24 January, the Alexandra Shackleton slipped away from Elephant Island, rowing out under her 14ft (4.3m) spruce sweeps to escape the ice and the lee of the land. “We wanted to get as much northing in as early as possible,” Aussie navigator Paul Larsen would say later. With him were Tim Jarvis (Anglo-Australian), sailor Nick Bubb (British), bosun Seb Coulthard (British, RN), mountaineer Barry Gray (British, RM) and Ed Wardle (British, cameraman and mountaineer). It wasn’t long after raising the sails, once out of the lee of land, that the Alexandra Shackleton was hit with much of the magic and enormity of the Weddell Sea and the Southern Ocean. The first day featured a close whale sighting, an iceberg encounter, five hours becalmed – and then the seas started rising. By day three, the boat was racing downwind at up to seven knots, corkscrewing over the 20ft-25ft (6.1m-7.6m) swells, pushed by 50 knots of southerly wind. Thankfully, they were hit with nothing like the freak or ‘rogue’ wave experienced by Shackleton and crew in 1916, a wave that has entered the hydrographic canon and nautical folklore. The support boat Australis followed at a distance of 20 miles, coming close once a day to take photos, although during the storm, it went into a search pattern for the Alexandra Shackleton when all electronic communication failed. The little boat was successfully located just as Seb Coulthard, whose day job is retrofitting Navy helicopters, finished making his repairs, so the relative safety of the mission was once again secured. Later on in the voyage Australis skipper Ben Wallis would note the regularity of ‘rogue’ waves when, 180 miles off South Georgia, peaks of 26ft (7.9m) would come “popping out of nowhere” in a sea that was averaging just half that. On days with good visibility, Australis, 20 miles away, was “a speck in the distance” according to navigator Paul Larsen. History seldom records, at least in writing, the jokes shared by men in acute discomfort but by day four, Tim’s diary already stated the jokes had staled. Reading between the lines, life on board must have been indescribable, four men sleeping “like badly folded accordions” as Seb put it, in a space the size of a small double bed, while those on watch were faced with wind-chill temperatures of -100C or worse, as well as directional uncertainty for most of the time, as Paul Larsen was only able to take three sun sights. The Alexandra Shackleton has no tiller, just yoke lines, the loss of leverage making steering a very heavy job, with a man sometimes required on each line. This was one of the elements that made this replica voyage more taxing than the original. Ultimately, they can’t be compared – one was life and death, a voyage of desperation against a backdrop of dwindling supplies and unimaginable hardship and fear, while the other was a voyage bolstered by the safety net of every modern communications and safety device known to man – including the support ship. And yet, to paraphrase Paul Larsen, it is easier to be pushed off a building than it is to jump. “I turned this trip down the first time it came up,” he told CB. And, Tim Jarvis points out that knowing help is at hand “ate into our resolve”. And many of the incidental discomforts were worse too: the present-day crew were physically larger, which made the cramped conditions even worse; a lack of acclimatisation to the cold, even though they had warmer air temperatures than Shackleton’s winter (April) voyage; the water, infected as it was with the vinegary taste leaching out from the whisky barrel, was as putrid as Shackleton’s brackish water; and then there’s the thing that’s impossible to prove but no less true for it – we humans are not nearly as tough as we were a century ago. One of the biggest problems for these modern-day adventurers was the pemmican – yes, the trip’s authenticity charter extended to food. Don’t be fooled by Arthur Ransome novels into thinking that pemmican is a sort of jolly, vintage tinned meat eaten on dinghy-sailing holidays. Real pemmican is lard with dried beef floating in it. As Seb Coulthard explained: “You have to eat it red hot. We used an old Primus stove. We bought the kerosene in Argentina and it gave off an awful smell. The stove was leaking from two days into the trip. That and the smell of beef made everyone sick over the side.” Paul Larsen added: “It gets everywhere – your bedding, your clothes, your beard…” As far as possible, they stuck to other Shackleton- approved food: hot milk, nougat, biscuits and Bovril. 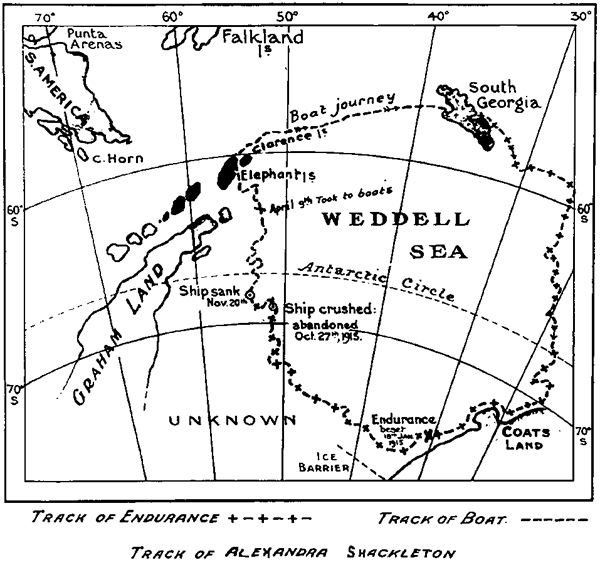 Twelve days after their departure (Shackleton took 16), the little boat made landfall in King Haakon Bay, South Georgia, six miles from Shackleton’s landfall. And just like the original voyage, the last hurdle was the hardest, with a headland to lay against the wind in an unweatherly boat. At one point the Alexandra Shackleton was inside the rocks, the support boat helpless and a lethal lee-shore situation looming. With half the crew in the bows to dig the nose in, she made it around the last headland and felt the scrunch of gravel under her forefoot. “You know what it’s like when you pinch a difficult mark? It’s all beer and skittles from there on,” Paul Larsen told CB with a chuckle. The Shackleton Epic, as it is officially known, was not the first attempt to recreate the 1916 voyage in a replica craft. That accolade goes to German explorer Arved Fuchs, who successfully made the passage in another James Caird replica in 2000. The feature that sets Epic apart was the amazing level of authenticity – everything from food and clothing, to the boat itself. In charge of gear and boat modifications (the Alexandra Shackleton was supplied by IBTC as an empty shell) was Seb Coulthard RN, voyage bosun. It was Seb’s job to collect all the vintage gear to complete the list of necessary equipment. Although the boat carried every modern safety device, these, apart from the VHF to relay messages to the support ship, were only used in extremis. From day to day, the men lived much as Shackleton’s crew did in 1916. This meant equipping the boat with oars (a unused set was found in a deep, dusty corner of Portsmouth Historic Dockyard), sails, rigging and much more besides. Seb tracked down Philip Rose-Taylor to act as sailmaker; Philip is one of the last surviving men to have sailed around Cape Horn on a cargo-carrying Tall Ship, and after measuring the James Caird in situ at Dulwich College, he made the sails from flax canvas, hand-stitching every part of the ketch-rigged lugger. While this was going on, the search was on for a list of navigation equipment that included a Heath & Co sextant; Thomas Mercer marine chronometer; E. Dent & Co pattern 182 Admiralty boat compass (gimballed, and alcohol filled), vintage binoculars and an S. Smith & Sons pocket watch. The diaries from Shackleton’s voyage also contained exhaustive lists of food and equipment for Seb to work from. For the sextant, Seb found a 1954 Sestrel model very similar to the Heath & Co version – “and it was free!” he adds. 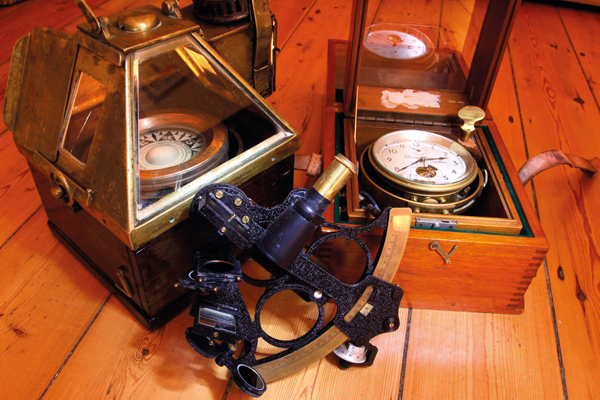 A boat compass of the exact same model was procured, and was even cracked at the same place in the lens as Shackleton’s. When swung, it showed zero deviation. Seb found a Thomas Mercer chronometer too. This one, a similar model but from the 1950s, is so accurate that it sat in the offices of the Sydney Harbourmaster and was used until the 1970s to give an accurate time for ship captains to set their chronometers. It lost precisely two seconds a day on land and four at sea. With the three main instruments dealt with, Seb concentrated on the pocket watch (for budgetary reasons, an Elgin pocket watch from 1916 was substituted for the S. Smith & Sons watch, which fetch thousands on the secondhand market). The Elgin pocket watch worked reliably in Seb’s freezer, his airing cupboard, and on board the ship in the Antarctic. Ed Wardle tracked down the vintage clothing, which comprised woollen jumpers, shirts and underwear, Merino socks and Merino long johns, jackets of tightly-woven cotton, which they waterproofed with boot dubbing, and leather boots with plain leather soles. 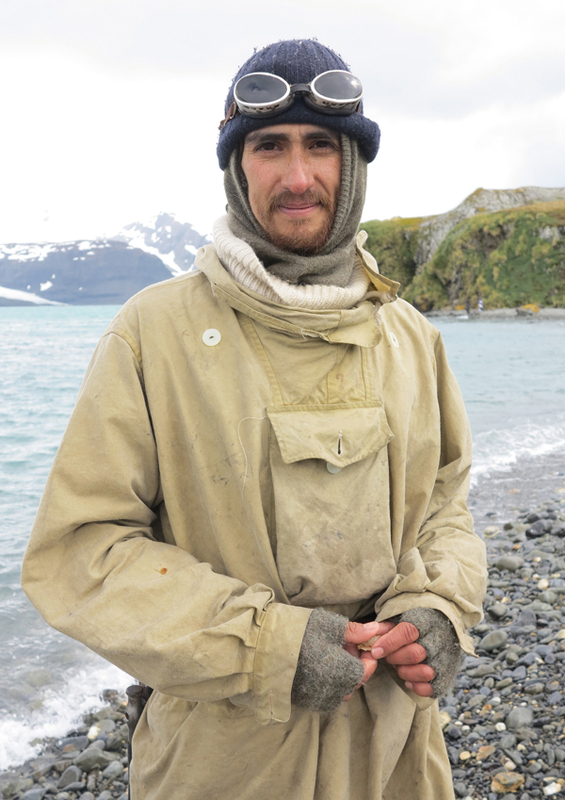 The jackets were “water-resistant” rather than waterproof, Seb relates, and the wool, contrary to common wisdom, kept him and his crew warm when wet. For ballast, Seb filled the boat with 1,763lb (800kg) of stone in hessian sacks, tied down with wet manila rope (which tightens when dried). Capsize tests showed that more was needed to make the boat self-righting. 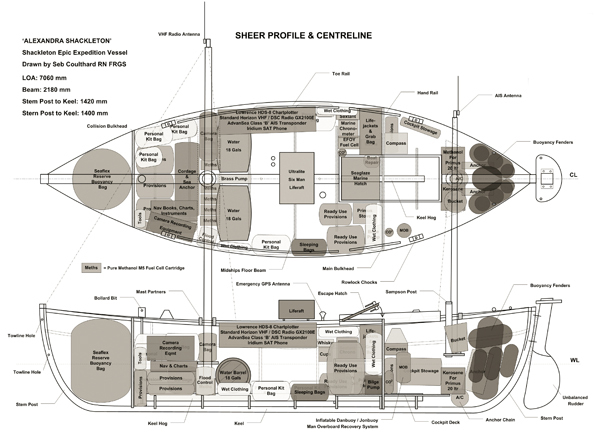 The eventual figure was found to be 2,328lb (1,056kg) – just 88lb (40kg) more than the amount Shackleton estimated would be necessary for the James Caird. In contrast, the modern kit, particularly the AIS, performed very poorly, and Seb wishes to take this chance to warn CB readers that AIS transponders have nothing like the range claimed by the makers. “Four to five miles” on the tin was a few hundred yards in reality. Seb also wishes to emphasise, after tank-testing lifejackets in a simulated storm at the RNLI pool, the importance of crutch straps and a sprayhood. In a simulated Force 5 in a warm pool, they made all the difference. Barca indubitabil clasica, instrumente de navigatie la fel, iar echipamentul ala nu pare sa aiba eticheta Musto si nici Helly Hansen ci bate mai mult in prelata autentica si nitel roasa pe la maneci. Expeditia imi aduce mult a "Brendan" .